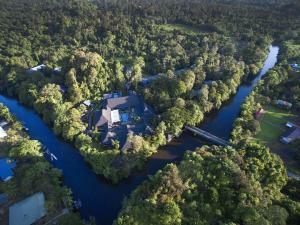 Providing river views, Kenny's B&B in Mulu offers accommodation and a garden. A balcony with garden views is offered in each unit. Guests at the bed and breakfast can enjoy a continental breakfast. There is an in-house restaurant, which serves a variety of American dishes and also offers vegetarian and halal options. Kenny's B&B offers a terrace. If you would like to discover the area, cycling is possible in the surroundings. The nearest airport is Mulu Airport, 2.3 km from the property. When would you like to stay at Kenny's B&B ? This single room has a balcony, patio and barbecue. Please inform Kenny's B&B in advance of your expected arrival time. You can use the Special Requests box when booking, or contact the property directly with the contact details provided in your confirmation. A tourist tax of RM 10 per room per night is applied to all foreign guests. This tax is not included in the room rate and must be paid upon check-in. Guests with a valid Malaysian Identity Card or valid permanent residents MY PR Card are exempted. Each day we'll check prices and send you an email for your selected dates at Kenny's B&B. If you don't have specific dates but would like to check prices for say next weekend or say next month we can check the price too. Click to write a review and share your experience of Kenny's B&B with other travellers.